Pakistan all-rounder Mohammad Hafeez has been banned from bowling for a third time by the International Cricket Council because of an illegal action. 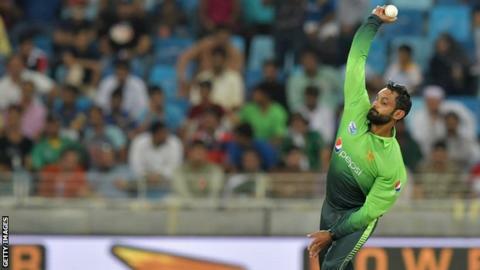 The off-spinner, 37, was cited by umpires in Pakistan's seven-wicket win over Sri Lanka in a one-day international on 18 October. He failed an independent assessment at Loughborough University on 1 November. Hafeez, the top-ranked all-rounder in ODIs, was also suspended in November 2014 and given a year ban in June 2015. The assessment in Loughborough revealed that the majority of his deliveries exceeded the 15 degrees level of tolerance in his arm. Under ICC rules, Hafeez can bowl again once his remodelled action has passed another assessment. Hafeez was suspended after his action was cited in November 2014, but returned in April 2015. He was given an automatic 12-month ban when - as a second offence within two years - he was reported in June 2015.